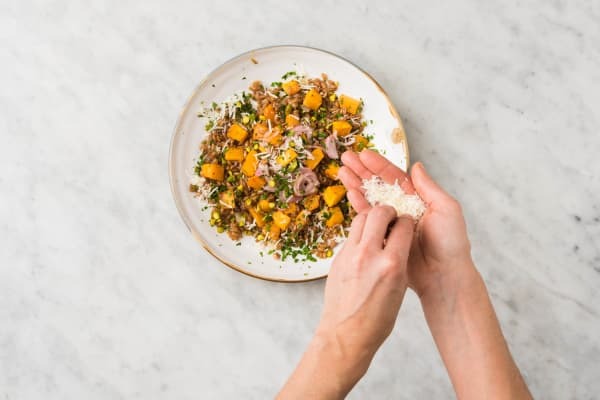 Treat yourself to a power half hour with this 30-minute meal that has some seriously nourishing ingredients. 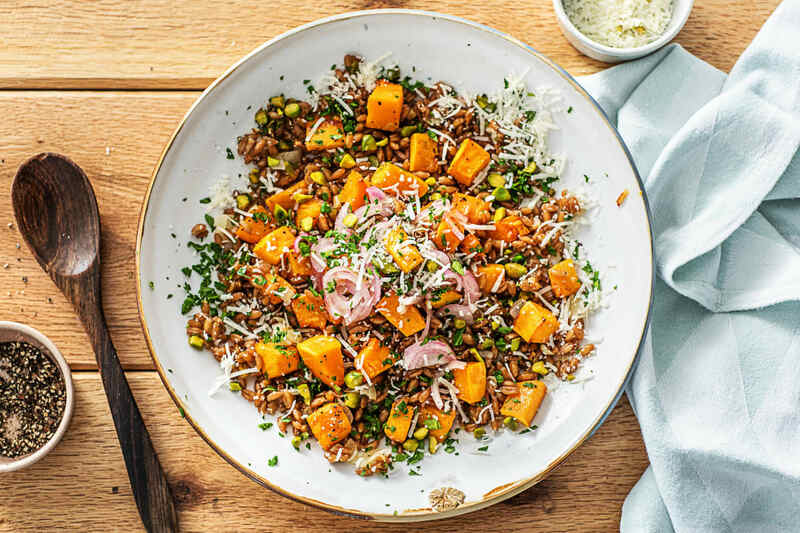 Between the vitamin A– and C–loaded butternut squash, fiber-packing farro, and mineral-rich pistachios, every bite is loaded with nutritious deliciousness. 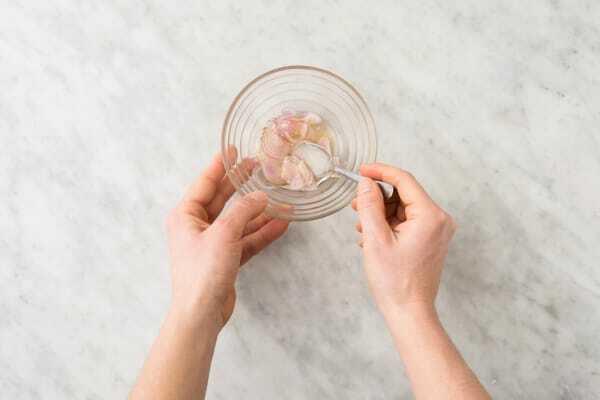 But this dish also goes beyond feel-good wholesomeness: thanks to pickled shallot and Parmesan, it’s got some swagger and bite, too. Adjust rack to middle position and preheat oven to 425 degrees. In a medium pot, stir together farro, stock concentrate, and 3½ cups water. Bring to a boil and cook until tender, 30-35 minutes total. 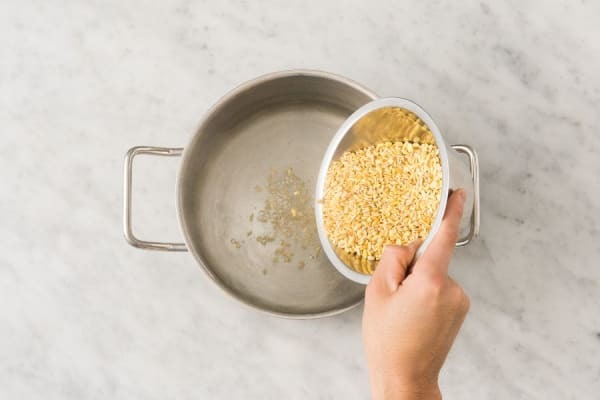 TIP: If water evaporates before farro is done, add a splash more. Wash and dry all produce. 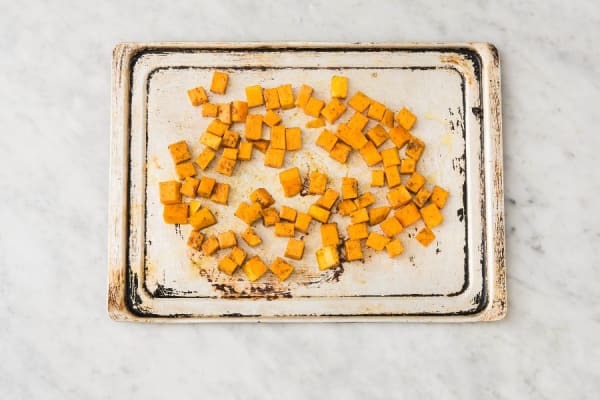 Toss squash with a large drizzle of oil on a baking sheet. Season with salt and pepper. Roast in oven until tender and browned, about 30 minutes, tossing halfway through. Meanwhile, halve, peel, and dice onion. Mince or grate garlic. Halve, peel, and thinly slice shallot. Finely chop parsley. Place shallot, vinegar, and ½ tsp sugar in a small bowl. Season with salt and pepper, then toss to combine. Set aside. Heat a large pan over medium heat. Add pistachios and toss frequently until toasted and fragrant, 3-4 minutes. (TIP: If nuts seem like they might burn, remove pan from heat for a few seconds.) Remove from pan and set aside to cool. Roughly chop once cool enough to handle. 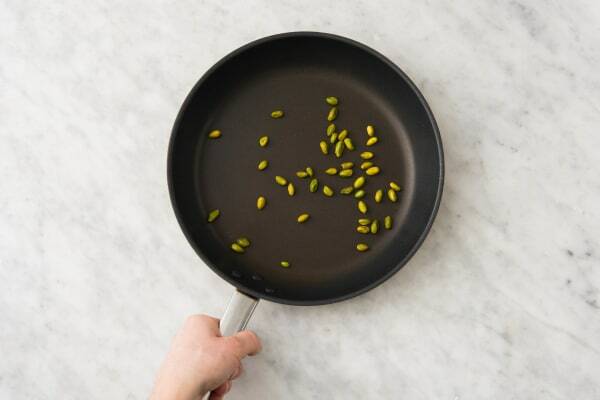 A few minutes before farro is done, heat a large drizzle of olive oil in pan used for nuts over medium-high heat. Add onion. Cook, tossing frequently, until softened, 3-4 minutes. Add garlic and cook, tossing, until fragrant, 1 minute more. 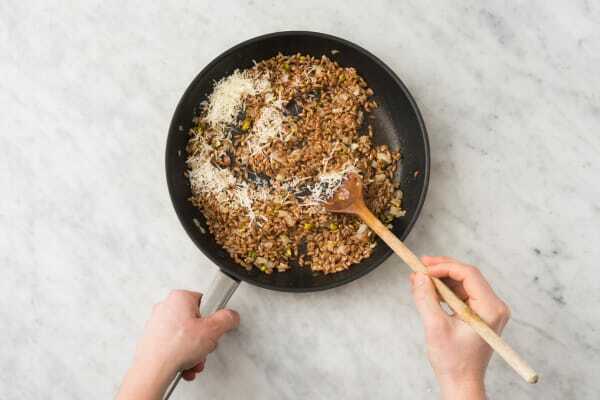 Once farro is tender, drain any excess water, then toss into pan with onion and garlic. Stir in half the pistachios, half the Parmesan, and 1 TBSP butter. Remove pan from heat. Add half the shallot and all of its pickling liquid to pan with farro. Toss to combine and melt butter. Season with salt and pepper. Divide farro mixture between bowls. Top with squash. Sprinkle with remaining pistachios and Parmesan. Garnish with remaining shallot (if desired) and parsley.